Venetian blinds are probably one of the most popular types of blinds used in interior design. 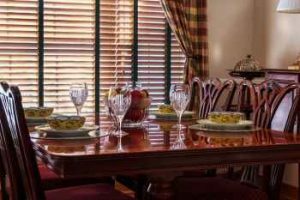 From our experience with clients, we’ve found that venetian blinds are often the best fit for many different types of homes and architecture. They are manufactured using a range of materials from wood, aluminium, and PVC. Wooden venetians are ideal for complementing rustic, classic looks whereas the use of aluminium or PVC can create a modernist, elegant style. Often, venetian blinds are laid out horizontally with slats that can be adjusted to manage the amount of light and privacy. These blinds are typically adjusted with either a cord or a rod, although higher-end ones may have electronic motors and remote controls. When you want simplicity in your interior design, look no further than roller blinds. Don’t let the simplicity fool you – the style is strikingly elegant and can certainly astound when surrounded with the right interior design. One of the best aspects of rollers is that they come in a variety of different styles. The bottom of the blind can be anything from plain horizontal to curvy and sprinkled with castanets. Blind rollers are adjusted typically with a cord that allows the blind to be raised and lowered. This is a great, inexpensive solution that also meets the needs of our interior design clients, especially the ones who are on a budget. For those who are looking to really make a statement with their interior design, roman blinds are one of the most stylish kinds available. Constructed from loops of fabric, they provide an elegant look that is difficult to find with other blind types. In contrast to rollers they are raised in folds that loop the fabric and when lowered, hang like panels. There is a wide range of colours to choose from and there’s no question you’ll find some that will truly inspire you. Although our interior designers in Manchester, Cheshire and Stockport tend to prefer roman blinds versus other types, it really depends on the decor of the living space. It’s important not to overdo it or else it may clash with the rest of the interior design.